AT LAST count there were an astonishing 66 different car brands for sale in Australia; down from 67 now Opel has made a hasty retreat. With so much choice for you the buyer, it's easy for some manufacturers to slip by your radar, especially the less established ones. Ssangyong fits squarely into this category, with most of us only familiar with the Korean company due to some of its less than conventionally styled products. The Korando is the ace in its pack however, with the compact SUV's looks and price point showing it deserves more than a passing glance. I tested the Korando S petrol model at launch a few years ago and came away fairly impressed, but it was crying out for a diesel in the range. The SX offers this with a 2.0-litre four-cylinder good for 129kW and 360Nm, and with an auto gearbox and all-wheel drive, this car stands alone in our overcrowded market with a cheap drive-away cost. That's a great price for a growing family intent on a four-wheel drive SUV lifestyle and diesel economy, and the Korando's attractive if not quite heart-fluttering design means you won't be ashamed to be seen stepping out of it. 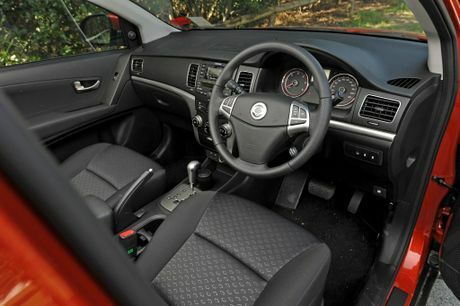 The cabin feels huge inside, with genuine space for five adults thanks to a wide middle seat at rear. These back chairs also have the ability to recline, meaning back seat passengers can lay back, close their eyes and imaging they're being chauffeured in an S-Class Merc. Not bad at this price. Boot size is also plenty for most families, while safety is comprehensive with six airbags, rollover protection, seat belt pre-tensioner and three Isofix child seat anchors. In this Korando SX you're also blessed with reversing sensors, cruise control, hill start assist, USB and AUX port and Bluetooth - so spec is hardly stingy despite the low price. Naturally it's no Audi inside though, with interior design, plastics and switchgear a bit on the basic side. 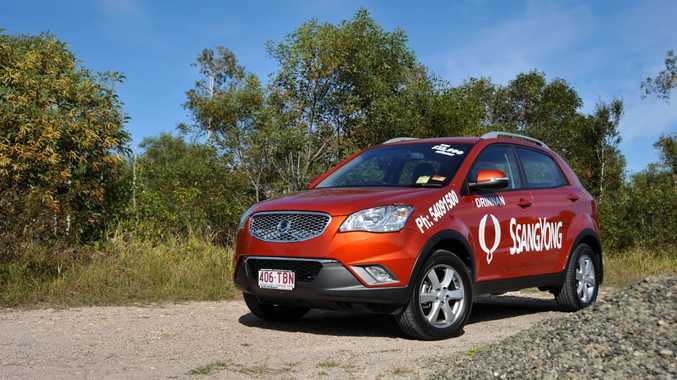 Money has been spent ensuring the Korando is a reasonably fun steer however. Get the Ssangyong through some turns and its behaviour is surprisingly compliant, with decent levels of grip and not much body roll at all. It also behaves very well at motorway speeds, remaining comfortable and predictable over long journeys and even shows a decent turn of speed when pushed. Its 129kW of power isn't to be sniffed at, and in the middle of the rev range you get a nice chunk of torque to shift this compact SUV up to speed. It's not the most dynamic or refined diesel motor though - certainly compared with some of its higher-priced rivals - and it certainly harks back to the noisier diesels of a decade or so ago. A few small complaints then, but the Korando SX remains excellent value for money with its decent level of equipment for your dollar. A five-year warranty including roadside assist comes as standard, meaning Ssangyong is backing itself that the Korando will prove reliable and one to be considered by the burgeoning compact SUV market. And in this diesel SX version with auto 'box and all-wheel drive, it's the most relevant model for our market and only a few grand over the petrol-engined 2WD version. Model: Ssangyong Korando SX Auto. Engine: 2.0-litre four-cylinder diesel generating maximum power of 129kW @ 4000rpm and peak torque of 360Nm @ 2500rpm. Bottom line: From $28,990 drive away.